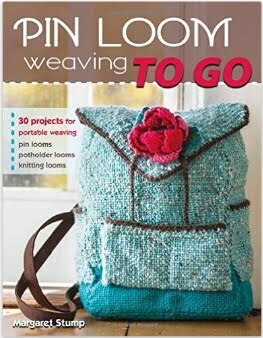 Pin Loom Weaving: Come flowers, come Spring! This has been a long winter, the snow topped out at about 36 inches in my back yard. Its beginning to melt now and the days feel longer but I want signs of spring RIGHT NOW -- not in the 6 to 8 weeks that it will take for Spring to make it to Minnesota. 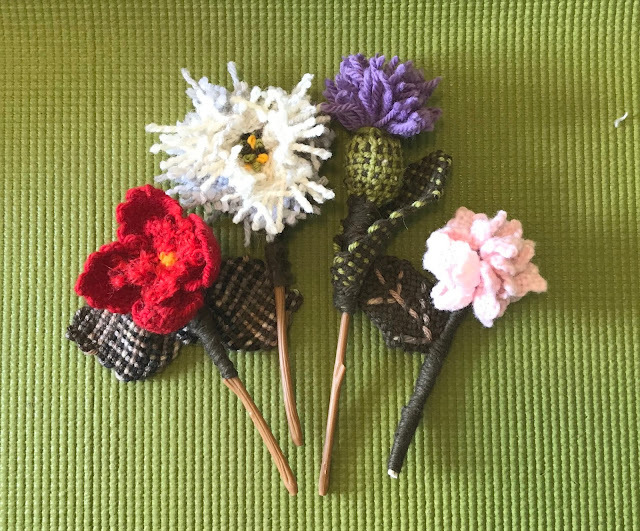 So for all those who seek signs of Spring, here are some pin loom posies. The two on the left, known as Loom Blooms, are made by pulling on a warp and weft thread in the middle of a 4" square. 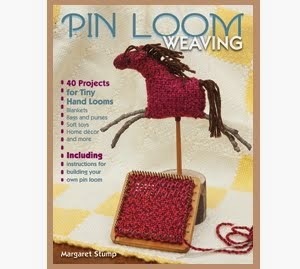 The directions for the raggedy loom bloom are found here. The third flower is my interpretation of a Scotch Thistle and I am still working up some directions on it. 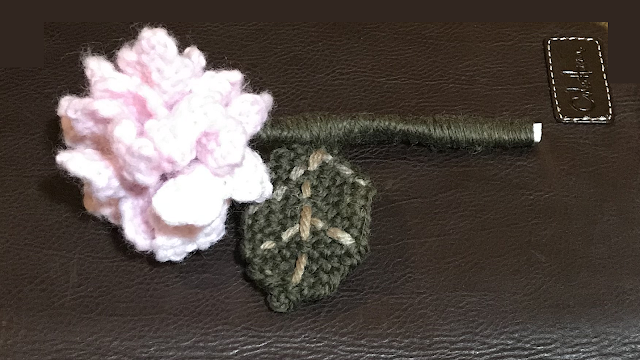 The little flower on the right and shown below is a compound flower made with six - 2" loom blooms. To make the flower, weave the 2 x 2" squares and pull on the middle weft and warp thread to turn them into loom blooms. Tie the pulled threads together to maintain the flower shape. Add some stitches of a contrasting color to the middle of the blooms. Take a tapestry needle with the flower color yarn and stitch through the flowers, gathering them together in a ball. I decided to mount the flower on a stick for a stem. I added dark green yarn wrapping to the stem as well as a 2" square with two corners turned back to make a leaf. 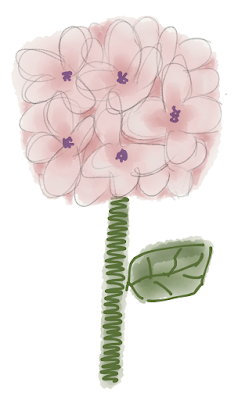 Making a compound flower takes some time but this concept could be used with many variations. Weave a bunch of 2" red-orange squares and turn them into a geranium. Make small violet flowers, tie them in rows to a stem, and you have a hyacinth. There are a lot of compound flowers, so this technique could improve many projects. As for me, I think my summer is going to include a really big pin loom geranium.